Tamil actress Jyotika, who returned to the silver screen nearly after a gap of eight years with “36 Vayadhinile”, on Tuesday said the success of the movie was due to support of the people who wanted to “empower and celebrate womanhood”. ‘To my fans, cinema lovers’ n the respected Media. Few words straight from my heart, I’m overwhelmed with the love and respect you all have shown towards 36 Vayadhinile..! Suriya , our production house 2D, and the most memorable welcome for Roshan and myself. Opportunity knocked my door and I did this film with a fire inside me believing that women should be respected for being home makers as they juggle between many roles in day to day life thereby losing the drive to chase their own dreams, giving heroines a better standing in this male dominated industry, n making women ourselves understand that our identity lies in our self-respect, confidence and achievements, and not just in our marital status. Standing proud today because of you all , all I can say is that each one of you who have loved 36 Vayadhinile and supported it are the reason to start the change, which is to empower and celebrate womanhood. Hoping to see many more Vasanthis strive to achieve their goals! Lots of love, respect and thankfulness Jyothika’. Post the tremendous success and happiness galore, Jyothika is all smiles about her re-debut. ‘I’m overwhelmed with the love and respect towards ‘36 Vayadhinile’. I did the film with a fire inside me, believing that women should be respected for being homemakers as they juggle between many roles in day-to-day life, thereby losing the drive to chase their own dreams’ reveals Jyothika. ‘I also did the film because I felt it will give heroines a better standing in this male-dominated industry and it will make women understand that our identity lies in our self-respect, confidence and achievements, and not just in marital status,’ she concludes. ‘8 years as a devoted mother, very efficient home maker and a serious health enthusiast is quite a tangent from being one of the most sought after heroine who has worked tirelessly for 10 years. Now again with a free will to get back to do something which gives inner peace and happiness is something every women should pursue. A happy woman always means a happy family. Hope this film inspires a lot of households! All the best Anni For a great success!’. 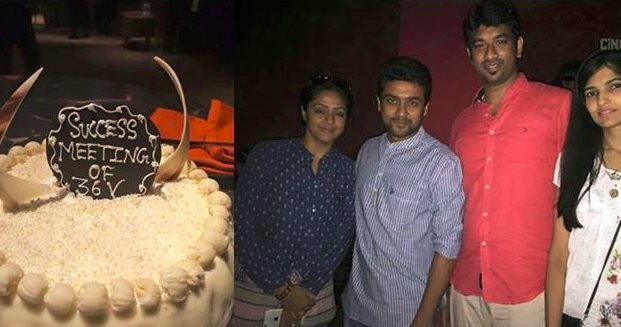 Jyotika plays the role of Vasanthi while Rahman essays a supporting role in the movie, directed by Rosshan Andrrews, penned by Bobby Sanjay and produced by Jyotika's husband Suriya under his home production studio 2D Entertainment. Music is composed by Santhosh Narayanan. The movie depicts the daily struggle of a house wife and her desire to chase her own dreams.